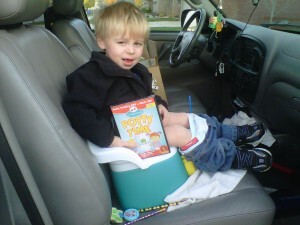 After watching Potty Time for the second time last night, my son Jack (2 years) went #2 on his potty!!! After 3 days of basically “lock down” it was a great accomplishment. Madie… is also coming along. She woke up dry yesterday, took off her diaper and went to the potty by herself. Also, a great accomplishment!!! We are slowly getting there. I have to say, potty training is NOT easy!! And I have to say, the music is AWESOME in Potty Time! We sang the “Celebrate” song after Jack’s victory!!! Yeah for great music. I am still humming all of the songs today. And BTW, we have already watched Potty Time 8 times in my house. The dvd only showed up yesterday at 4:00p.m. We all love it!! Thanks Potty Time for making this a little bit easier. I am so glad that you made the timer watch large enough for me to wear! I am wearing the watch right now since my daughter…will only eat the watch. She would destroy it in minutes so I was very grateful that I could be the timer person in my house. It also made sense for me to wear it since it is “My job” is to do the reminding for my kids. I tend to get carried away with work and phone calls, emails and such and the timer is a great reminder for ME to go ask who has to go potty. So, I am loving the watch and it is super cute so I don’t mind showing people what I am wearing when they see it and ask me a question about it. So, yeah Potty Time, you guys got it right!!!! AGAIN!! And finally, even my husband sat and watched Potty Time with us and sang the Celebrate Song when my son completed his first poop in his potty. It was a great day for us!! Getting Dad involved is a great step – celebrate potty training with the whole family! We’re going to “celebrate and clap our hands” right along with you! And… since this blog was originally drafted, Monica reports that Jack is nearly done potty training and Maddie is coming along beautifully. 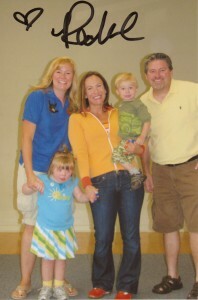 Way to go Blouin family! UPDATE: You can read more about Monica’s journey with her daughter in Potty Training Madie: A Story About Potty Training and Down Syndrome. This entry was posted in General and tagged celebrate, colleen, diapers, incentives, parenting, portable potty, potty time, potty training, potty training boys, potty training girls, potty training resources, potty training special needs, Potty Watch, special needs by colleen. Bookmark the permalink.